FÉILE FIDELMA 2019 OFFICIALLY ANNOUNCED FOR SEPTEMBER 6-8, 2019 IN CASHEL!! 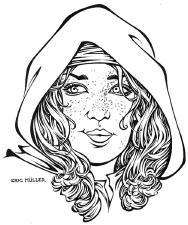 Sister Fidelma is an Irish religieuse of the 7th century AD who is also a trained advocate of the ancient Irish law system of the time - the Laws of the Fenechus, popularly called the Brehon law system. She is the heroine-sleuth of a series of popular novels and short stories by author Peter Tremayne. When the first stories began to appear, the UK Book and Magazine Collector prophesied: "Sister Fidelma promises to be one of the most intriguing new characters in 1990s detective fiction." They have been proved right and Sister Fidelma has now survived into a new decade with a still growing following. "Sister Fidelma is fast becoming a world ambassador for ancient Irish culture," says the Irish Post. The USA Publishers Weekly has called her: "A brilliant and beguiling heroine; immensely appealing..." And the Ellery Queen Mystery Magazine has said she is "One of the most interesting sleuths to come on the scene in recent years." NOTICE: Any statements purporting to represent the views of Peter Tremayne / Peter Berresford Ellis, his family, or The International Sister Fidelma Society should be discounted and ignored unless they are verifiably made officially by Peter and/or by David Robert Wooten as Director of the Society. T-shirts, maps, sweatshirts, mugs, totebags, mousepads, more!! Visitors to Fidelma's "hometown" of Cashel are advised that the Cashel Heritage Centre stocks copies of the complete series of the Fidelma Mysteries. Céad Míle Fáilte! 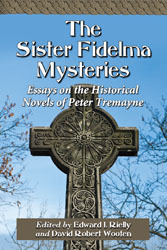 A Thousand Welcomes to the Sister Fidelma Mysteries website. This site is provided for everyone interested in Peter Tremayne's international bestselling mystery series and, indeed, to those interested in all his work both as Peter Tremayne and his non-fiction work as the Celtic Scholar Peter Berresford Ellis. It is provided free of charge through the courtesy of The International Sister Fidelma Society. We would like to point out that this is a Society of volunteer workers, entirely funded by membership subscription. We provide not only this website, but all subscribing members to the Society get our print magazine, The Brehon, sent to them three times a year, and are updated on all activities. Why not join us? Click on THE SOCIETY link above and find out what we have to offer, and to join our ever-growing organization. "When is the next Sister Fidelma book coming out?" For eBooks check publishers' websites, Amazon, Barnes Noble, Waterstones etc. Für deutsche Fans - Wenn Sie eine Frage auf deutsch stellen möchten, klicken Sie bitte hier. Voor Nederlandstalige fans - Als u in het Nederlands een vraag wilt stellen, klik dan hier. Fidelmaniacs around the world will be eminently familiar with the iconic image of Sister Fidelma used on virtually all of the Society's website pages, program booklets, flyers, etc. This beautiful painting, with which I fell in love many years ago, was graciously provided to the Society by Hans van den Boom of Peter's Dutch Publisher (and the publisher of the brilliant new graphic novels) De Leeskamer. I think all will agree on this image has been a wonderful depiction of the good Sister. However, as one who has to work with the image from a graphic/creative standpoint, I have always had to accommodate for the original image's layout within a Celtic knot framework, which essentially "lopped off" the back 1/3 of her head. I have usually made some sort of modification in my own projects to take this into account, but I have felt, for years, that we needed an "updated" - and "freestanding" - image of the good Sister for use as we enter the 18th year of our existence. With that in mind, I contacted a brilliant artist, and good friend, Eric Müller, who has rendered a wide variety of illustrations through the years of the famous, infamous, celebrity, or common man (he even rendered both my daughter and me in amazingly accurate portrait style). In fact, his amazing portrait of Fidelma's creator is now forever part of a large tribute piece presented to the author during the anniversary months of his 50th year of publishing, his 100th title actually published, and even his 75th birthday. Each of these individual events is a milestone in itself, but combined I think you will agree that something special had to be done. As noted, I took it upon myself to have rendered not only the creator of the titular character of the Fidelma series but the good Sister herself. Unaccustomed as Eric was to rendering a character completely out of "thin air" as one might say, I gave him both Peter's own descriptions of the character from the novels, as well as an actual living, breathing actress, I felt embodied the look and character of Fidelma. After a few back-and-forths, Eric came up with the beautiful image you see here (and, once again, I am in love with this woman). Peter agrees with me that this rendition of his creation is both lovely and true to form (which was my ultimate hope). Peter then immediately chimed in with "Naturally you are going to have her rendered in color," a process which I had already undertaken when he commanded such a task. I had turned to longtime friend and equally brilliant artist Franchesco! for suggestions as to qualified artist who could color the good Sister to my standards. He noted that he, himself, was not accustomed to coloring other artists' works, as he did not want to enforce his style onto their artwork. While Eric is a brilliant penciller and inker, his coloring work is primarily confined to using colored pencils to render original artwork (with wonderful results). So, as I patiently waited for Franchesco! to provide contact information and samples of qualified colorists, imagine my surprise, delight, and amazement when Franchesco! emailed me back - not with the names of other artists, but with his own digital coloring of the good Sister, now seen at upper right on this page and front-and-center of our lead page. 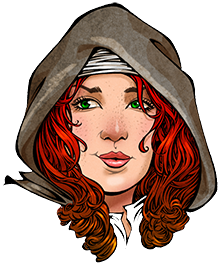 With only a few minor tweaks requested by me, we ended up with what I consider to be a true image of Fidelma, and someone to whom I would gladly play Eadulf against in the novels. I certainly hope you will all agree with the ultimate depiction of “David’s Fidelma,” and welcome your comments via email to david@sisterfidelma.com. Just as we updated the look of Sister Fidelma on our website and elsewhere, we felt we were long overdue for a bit of added "character" to the main page of the website. After all, this is the page that's meant to lure in the Fidelma fan, fellow Fidelmaniac, and hopefully, potential International Sister Fidelma Society member. Yes, we all love the good Sister, but the "bottom line," as it were, is that we are always recruiting to bring more fellow Fidelma fans into the fold (and your help is ALWAYS needed!!). So, to spruce up our intro page, we scoured the web for some appropriate Celtic music. We wanted something that was well short of Dropkick Murphy (whose music we certainly appreciate) and more like Enya (but a bit more Irish, sans vocals, and without the potential to quickly lull the listener to sleep). If you take a listen to the tune, we believe we have succeeded in this task - at least in our ever-humble opinion. But all that simply wasn't enough. What if someone is coming to our page had no idea who Sister Fidelma was (heaven forefend!)? They would need someone to quickly and succinctly explain who, what, where, and why, in hopes that the visitor will want to delve further into Fidelma's World. And it took no thought at all on our part to decide upon the narrator of this brief but important voiceover - "The Voice of Fidelma" herself. So, we sent Caroline an initial script which she tweaked ever-so-slightly, putting her own feeling and emphasis to the sentences, teasing the listener just enough to invite them into Fidelma’s World, as if they would truly be missing out if they did not follow her lead. 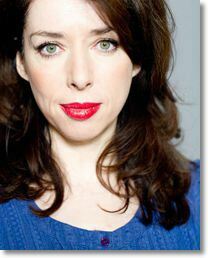 We cannot thank Caroline enough for her participation in this overall team effort, updating and enhancing the website to hopefully bring in a fresh batch of Fidelmaniacs who have been quietly lurking in the shadows, waiting for someone to ask them to come in. As ever, our heartfelt thanks go out to Caroline, as they should from all members of the Society. GREAT NEWS FOR U.S. FANS OF THE SISTER FIDELMA MYSTERIES! Beginning April 1, Severn House Publishers take over the US publication of the new titles in the series starting with The Night of the Lightbringer, from their distribution headquarters with Ingram Book Services in LaVergne, Tennesee (and there was much rejoicing… yaaaayyyy!!!). Following Lightbringer, Bloodmoon will also be released in both markets. This new title is due out from Headline, UK, and Severn House, USA, in July. Simultaneous title publication will also continue with Peter’s next contracted Fidelma novel scheduled for publication in July 2019. NO MORE WAITING A YEAR FOR THE NEWEST FIDELMA TITLE TO BE PUBLISHED IN THE U.S.!!! In the September 2017 issue of The Brehon, we reported the shocking news that, having published the series since February 1995 with the first title, US publishers, St Martins Minotaur of New York, announced they were ceasing to publish the series with Penance of the Damned. That title was produced by St Martins in July 2017, a full year after the UK edition. In our article “Bookless in Seattle,” we discussed reasons why St Martins made their curious decision to stop the series. It was not, we felt, that the books were any less popular, but because of self-inflicted distribution problems and the fact that the US editions continued to be published a full year or more after they were available in the UK, Canadian, and other English-speaking markets. There seemed no attempt over the years to obtain simultaneous publication, causing many fans to search for copies from other sources or give up altogether. Obviously, publication at the same time - on both sides of the pond - would have been more appropriate to maintain strong sales base in the US. We dealt with many complaints from fans over the years on this very subject. We felt sure that it would not be long before a more market-knowledgeable publisher would pick up the series for the USA, even though they were entering that market after 27 titles had been published in America by Minotaur. Publishers are usually loathed to pick up a series halfway through, let alone after 27 titles issued by another publisher. But the series, as we fans know, is ongoing, vibrant, and continuing. And this was, of course, immediately seen by a savvy publisher like Severn House. So our prediction was right. Severn House Publishers’ US operation is based in LaVergne, Tennesse, in a deal with the Ingram Book Company as distributors (a company which handles more than 7.5 million titles in US distribution). Severn House Publishers was founded in London in 1974 and immediately set up offices in New York for simultaneous publication. The company was taken over by Cannongate Publishers in September 2017, who also has a specialization in the US library markets. Contact for Ingram Publishing Services: 1 Ingram Blvd, LaVergne, TN 37086, USA. Email: customerservices@ingrampublishingservices.com. Severn House is very excited at the prospect of taking over Fidelma’s World in the US, and have promised an effective publicity campaign to announce their editions. We are reliably informed that Kate Lyall Grant, CEO of Severn House, has been a longtime enthusiast of the series, and is delighted that Peter is joining their US list. For the sake of continuity, as seen by their jacket for Night of the Lightbringer, Severn House will continue with a similar jacket format for the US series, seen here. So, we are now delighted to welcome Severn House, USA, into the Fidelma World! Of course, this is a good time to advise those US members who’ve been hesitant about renewing their memberships, caused by St Martins stopping the series, that their renewals will be more than welcome (just drop me an email at david@sisterfidelma.com and ask to be invoiced the $29.95 annual rate by Square or PayPal). We would never say “We told you so,” but we’d merely point out that Fidelma’s World is still alive and spinning, and will continue for many more years to come. PLEASE, mention the news to your fellow book reading friends, librarians, and bookstore contacts! You are on the front line, leading the charge to make fellow US readers aware of the better availability of Sister Fidelma titles. Now that the US has a simultaneous publication with the UK, there’s no excuse for us not to get the “Fidelma Show” back on the US road, where it should have been all the time. It is with deepest regret and sadness that we announce the passing of Peter's lovely wife, Dorothy. She was an incredibly vibrant spirit, and the true inspiration for Sister Fidelma. Members of the Society will receive a tribute edition of The Brehon for May 2016, including many photographs, stories, and condolences from individuals Dorothy touched all over the world. Those were the words of Seamus King, an organiser of a literary weekend in Ireland, at the funeral of Dorothy Cheesmur Ellis. The bi-annual weekend was devoted to the Sister Fidelma Mysteries, written by her husband, Peter Berresford Ellis, and set in Cashel, County Tipperary. The festival began in 2006, and the sixth weekend was due to be held in September but was postponed due to Dorothy’s illness. She died on March 30, aged 75, following a battle with cancer. 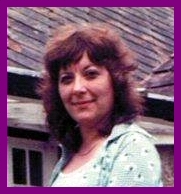 She had lived with Peter in Archway since 1981. The chapel at Islington Cemetery, in East Finchley, was packed on Monday for a humanist ceremony in her memory. Mr King told the service: “Dorothy has been an integral part of these weekends. Usually they attract people from different countries and sometimes a person may not know anyone on a first visit. Dorothy was good at noticing such a person and made it her business to become acquainted and make the person part of the group. “If Peter and other speakers were important at a formal level, Dorothy was vital on a social and personal level at making these weekends a success. The service was conducted by Steph Bramwell, of the British Humanist Association, who said that Peter had received messages of condolence from New Zealand, Japan, and Argentina. She added: “Dorothy was a vibrant personality, full of interests and full of energy, the sort of person who would welcome strangers and keep an eye out for anyone feeling lost or lonely. “She cared about community and about social justice. She loved music and dancing. She had a mystical side and a practical side. She was intelligent and resourceful and independent, with a zest for life and a gift for friendship as you can see just by looking around and seeing how many people are here. Dorothy was fascinated by Ireland’s history and culture. Her interest in the country was represented in the service by folk ballad The Fields of Athenry and 10th century poem Storm At Sea. That was chosen to represent the storm she went through with her illness. Dorothy was Labour’s fundraising officer in Islington’s Hillrise ward for a period. An active campaigner, she took a stand against a proposal to sell Ashmount School for housing. She was one of the first people to support Jeremy Corbyn’s 1983 election campaign. Last week he paid tribute to her spirit and tenacity. The celebration of Dorothy’s life continued at The Spaniard’s Inn, in Hampstead, a pub she loved for its literary connections. Donations can be made to St Joseph’s Hospice in Hackney, where Dorothy died. 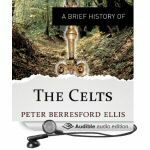 One of Peter’s non-fiction studies A BRIEF HISTORY OF THE CELTS has been issued by Audible Studios UK read by Christopher Oxford price Str£13.12. It is available on www.amazon.co.uk. The title is also available as an eBook (Kindle) as well as in paperback. This book was first issued in 1999 as THE ANCIENT WORLD OF THE CELTS, published by Constable in the UK, Barnes Noble, in the USA and was a ‘Book of the Month’ for the Ancient and Medieval History Book Club. In 2003 Constable re-issued it as a paperback with the new title and it was also re-published in the USA by Carroll & Graf. It has appeared in translation in such language as Bulgarian. BUY YOUR COPY OF THE FIDELMA GRAPHIC NOVELS BY CLICKING THE ABOVE GRAPHIC!! TITLE ABOUT FIDELMA AVAILABLE FOR PURCHASE! As most of you know, for some time there has been a map of Fidelma’s travels available for sale in support of the Society. Most of the books come with a simple lineart map, showing details of that particular novel, but nowhere else will you find a chart noting all of the good Sister’s travels (granted, some are still in far-off lands, remote from Éire, but are so noted on the map). While the map has always been reasonably well received, we have never been thoroughly satisfied with it. Thus, when it came time to update the map to Peter’s latest title (The Chalice of Blood)*, we felt a major overhaul was in order. The new map features all of the same locations, updated with the latest titles, but the map itself is much more aesthetically pleasing. Plus, it is now available in a larger, and easier to read, 23” x 35” size, as well as a smaller 11” x 17” mini poster print. So, if you’ve been holding out on this map, now is the time to buy one. Or, if you bought one of the original/earlier versions, now’s the time to update! The prints, from CafePress, are extremely well done, and are available unframed, as well as framed in smaller sizes. You can see these new items – as well as all other Sister Fidelma merchandise, including Féile Fidelma 2010! Items (and 2008!, and 2006!) – via our CafePress shop at http://www.cafepress.com/eclecticon. Just look for the INTERNATIONAL SISTER FIDELMA SOCIETY shop amidst all the others. *THE MAP IS NOW UPDATED THROUGH BLOODMOON, IN 2018!